Track and monitor group progress using the Class/Group Change Assessment form. 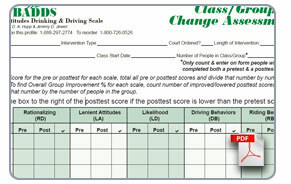 Use results to modify program content and collect tangible evidence on intervention effectiveness. Designed as a screening and assessment tool, the BADDS has multiple applications for its use. 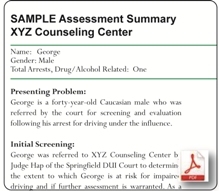 View a sample report to gain insight into how judges, probation officers, DUI/DWI educators and counselors use the BADDS. 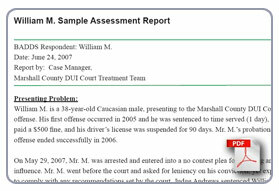 report derived from the use of both questionnaires.